Advanced Open Water Certification Dives Complete! View at Cave exit at Kei Kei Caverns (Horseshoe), Kawaihae Coast, Hawaii. Yikes…we are now AOW Certified! Maybe the next step, after a while, is the “Search and Recovery Diver” dive to see if we can recover the weight pouch that dropped out of my BCD on our Fish I.D. Dive, the second dive; although, I did better on my air supply on both dives! All-in-all, the whole day was great! 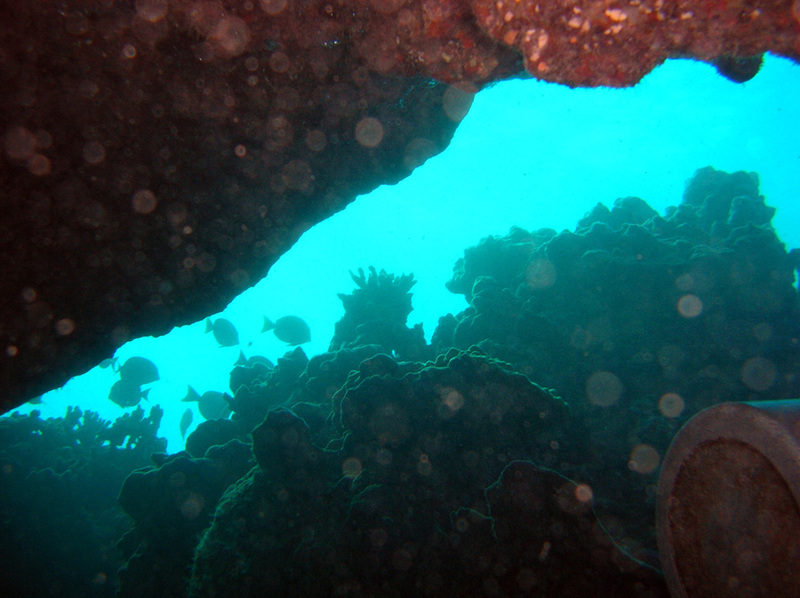 The first dive was our Underwater Photography Dive at Kei Kei Caverns (Horseshoe), Kawaihae Coast, Hawaii. The initial entry was brisk, as it always is this time of year; but once in, it was very nice! I FINALLY heard whale song and it was very melodic and lulling, not to mention Fantastic! However, I was not going to be distracted from the purpose of this dive so I took many photos and a few video clips. Several of my photos are quite decent regardless of my inexperience due to Andy having used the camera on previous dives before the second camera was acquired. 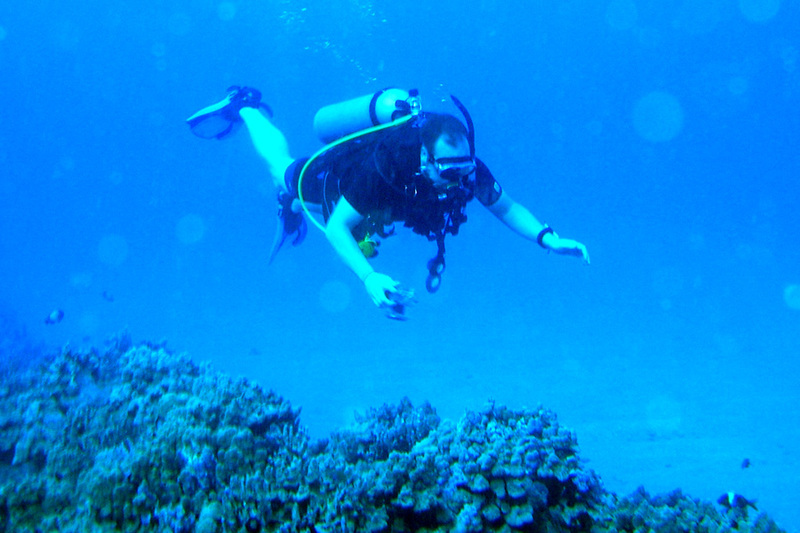 Andy examining the reef & fish during our 1st dive. 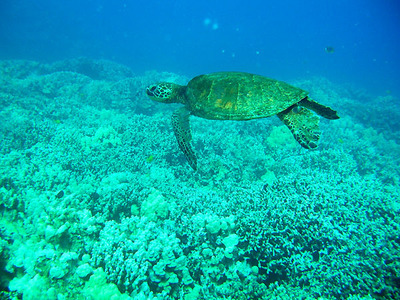 The first dive was at a site called Catholic Church, Puako. We went deep to 94 feet to see the Garden Eels mentioned in Part One and to give us an opportunity to determine how well we would conserve our tank of air at depth. 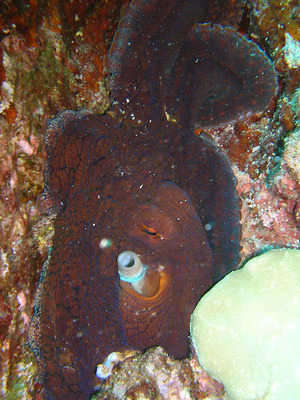 The water remained a nice temperature of about 75 degrees for the entire dive and visibility was better than 100 feet. 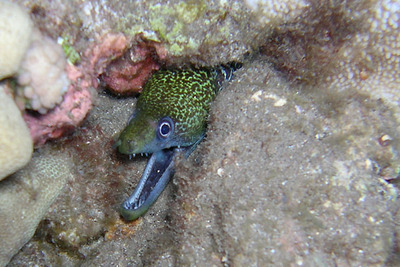 There are a few fish to see at the deeper areas of the reef; although at that site, the Garden Eels were about it at that depth. When we came back up to shallower water, we saw Many, Many tropical fish and water inhabitants. The Coral, WOW, the Coral! The Coral in just that one dive site looked like we traveled miles away in the difference between the deep Coral and the shallower Coral. Once you get past 40 or 50 feet, the colors are fairly well ‘a wash’ due to the lack of light and they get paler and paler the deeper you go. But the Coral was still beautiful in its shapes and textures that the shadows of the depth highlighted! When I got back to the shallower waters, I looked more closely at the Coral and noticed that the same textures are there, too; but I just didn’t notice them as much because of the more vibrant coloring and more intense shadows from brighter light. The shapes are still very different in the shallows versus the deep, though; and that makes sense because colonies (Coral ‘villages’) will each be individual in nature. Even the 3+ minute safety stop at 15 feet was far from boring! There were A LOT of the Black Triggerfish (Melichthys niger), aka Black Durgeon, and Hawaiian name is Humuhumu ‘ele’ele! There were too many for me to count so I merely marveled at the shear numbers. On the exit of one of the Arches, there was a very long Wire Coral that I was careful to swim wide around to avoid causing any damage. It is an interesting entity and it looks so fragile. At the shallower depths (only 50 feet at its deepest), I went through my air a lot more slowly so I was able to get a 53 minute dive in and it was spectacular! May your journey be pleasant and the road smooth and unfettered!